This is the first of a 3-part series of posts about the benefits of a raw food diet for your cat. Here are links to part #2 and #3. Why a raw food diet may be the best thing for your cat since prepackaged catnip. A lot of science suggests we humans should include more raw food in our diets, like fresh-picked fruit and uncooked vegetables. Mass-produced foods most of us eat, and feed to our pets is actually not that healthy. Cooking and/or processing removes valuable nutrients and introduces less healthy elements. Many "diet" foods contain things like "high fructose corn syrup" which is a substitute for cane sugar and other naturally-occurring sweeteners. Our bodies don't know what to do with many of these substances so they don't do us any good, or they can cause us harm and create environments friendly to inflammation and disease. Your body knows what do do with cane sugar and other foods which actually occur in nature. It's the same way in the pet food industry, only worse, since the pet food industry is not regulated nearly as much. In many pet foods, unhealthy additives and fillers are often included to boost volume, enhance flavor, improve shelf-life, ensure package integrity, and reduce costs. A diet consisting of mostly commercial cat food is a lot like a diet of breakfast cereal, candy bars and soda-pop. Your cat may love that premium-priced "life-stage" cat food, but it may actually be more effective at improving your cat's susceptibility to disease and shortening your cat's life. "Life-stage" and other special varieties of cat food products are just marketing to get you to buy a particular product. A life-long diet of dry food like kibbles will very likely keep your cat in a perpetual state of milde to seveire dehydration and destroy your cat's kidneys over time, causing kidney failure, very common in traditionally-fed cats. 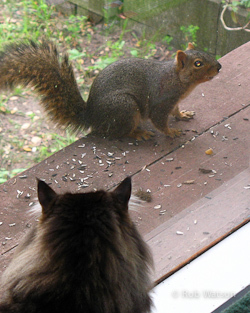 In the wild, and in your back yard, cats don't eat kibbles with wheat and cranberries or beef liver paté. Cats are predators, technically obligatory carnivores. They are designed to chase, catch, kill and eat rodents, birds, small reptiles, bugs and insects. It's what they do. Your veterinarian will tell you that small bones from fresh prey clean and strengthen teeth, and that those nasty critters your little hunter brings in the house contain just about all the nutrients she needs. Feeding your cat a raw food diet can do a lot of good for your cat, and you, including easier cleanup and less waste for the litter box, including reduction in odor, and possibly reducing your veterinary bill. Properly formulated raw cat food contains live enzymes necessary for good cat health. It takes significantly less time to digest, and many cat owners report significant outward improvements like coat health, mood improvements complete elimination or significant reduction of diseases like diabetes, kidney failure, skin problems and crystals in urine. At Bright Haven Wholistic Animal Retreat in Sebastopol, California, animals are fed a 100% raw-food diet and they routinely have cats who live 20 years and longer. 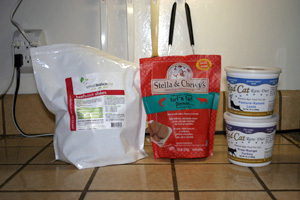 Raw food is available frozen, or in freeze-dried forms. It typically costs more by the package than mainstream canned and dry food, but when you look at the actual numbers - compare the actual protein and nutritional substance, not to mention the possibility of lower vet bills, the cost may actually be less than you think and who can put a price on a happier, healthier cat? Always consult with your veterinarian before attempting any changes to your cat's diet. Here are links to installments #2 and #3 of this series. REVIEW: "Ideal Hefty Pet Side Sliding Window Insert"
Rafter-mounted cat enclosure and "catzebo" let protected cats enjoy the outdoors, safely. Robin Jeffrey Watson. Awesome Inc. theme. Powered by Blogger.